There is a new car park on Station Wynd. The entrance to the trail is opposite the car park. 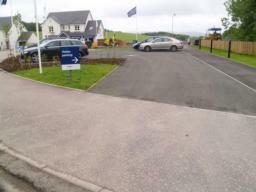 There is another car park in the new housing development further up Station Wynd. 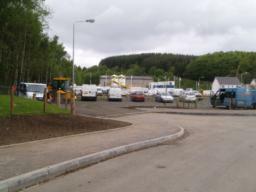 The entrance to the start of the trail is opposite the car park on Station Wynd. 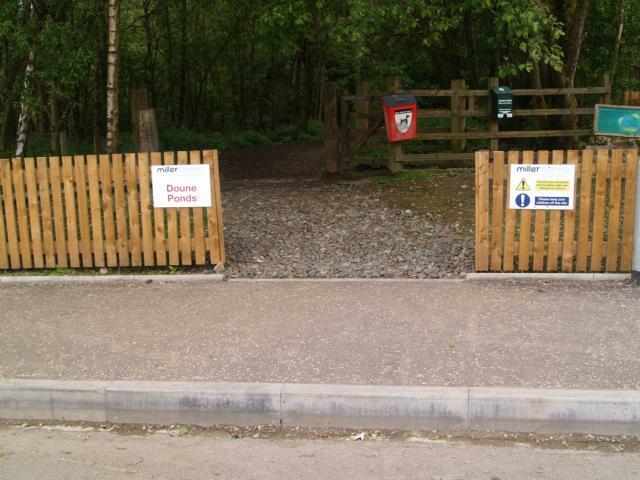 The trail passes through the gate at the car park. 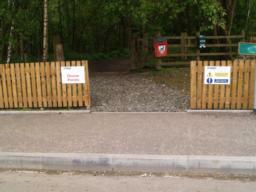 The gate on the left can be used without having to go into the kissing gate. 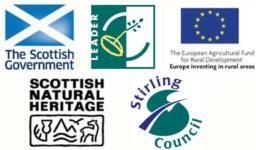 There is an information board by the entrance gate giving details of the Doune Ponds nature reserve and its trails. The path is wide enough for two people to walk side by side for most of its length.The surface is firm and level though there may be some muddy patches after wet weather. In autumn leaves covering the path may make it a little slippery and it may be difficult to see the path edge. At the first finger post sign fork to the right. Just about 100m from the car park at the path junction, the route to left is to the picnic area, the bird hide and the viewing platform on the pond.Stay to the right to follow the circular nature trail. In autumn there may be some areas where the leaves are quick thick on the path. Before taking the short slope down to the pond take the path to the left if you want to visit the bird hide over looking the pond. The bird hide is only 50m from the picnic area. The hide has a level entrance and viewing windows at different heights.The ramp is covered with chicken wire to prevent it becoming slippery but care may be needed if it is worn or broken as it may be a trip hazard or it could even puncture a wheelchair tyre. There is a space for wheelchair users in the hide. There is a gradient of 9% (1:11) for about 6m to get into the picnic area and reach the pond. An information board provides background on the ponds and their wildlife. There is a viewing platform on the pond which is reached along a short ramp with a gradient of 10% (1:10). There is a small step (50mm) to get onto the ramp. Returning from the picnic area to the circular path head on through the trees. The path remains wide and level. At the junction marked as "Kate's Corner" you have a choice. 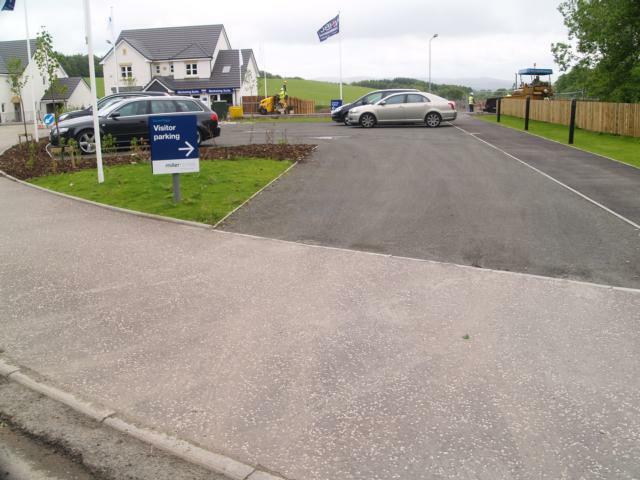 The right hand fork is the shorter route that is level and even all the way back to the car park.The left hand fork is on a narrower path which may not have enough room for two people to walk side by side all the way. It is about 200m longer and includes two short gradients the steepest being 16% (1:6) for 6m. The right fork at "Kate's Corner" provides a 50m short cut to the path that returns to the car park. Approaching from "Kate's Corner" turn right to head back to the car park. At the fork in the path keep right to follow the better surfaced path back to the car park. The path completes its circuit about 50m from the car park. Turn left to return to the car park. Following the left hand fork at "Kate's Corner" the path is a little narrower but it remains firm and stable. At the T-junction turn right to follow the circular route. When leaves cover the ground the path surface may not be very clear. There is a gradient of 11% (1:9) for about 15m. Away from the trees the path surface is more easily seen. At the junction bear left to return to the car park.The path to the right takes you back to "Kate's Corner"
The fork to the left just after the entrance leads to the hide overlooking the West Pond. The hide is about 350m from the car park. There is a gradient of 10% for about 15m. On the corner there is a gradient of 12% (1:8) for 20m. The surface is a little uneven going along this slope. There are patches of the path where the surface is a little uneven. The hide overlooking the West Pond has windows and different heights and spaces for wheelchair users.